Having grown up in the neighborhood, West Philly remains one of my favorite places in the city. It’s amazing to see the transformation that has taken place outside of just the Baltimore Avenue corridor. Four Worlds Bakery, for example, on 46th and Woodland, has one of the best olive rosemary loaves I’ve ever tasted and it makes people walk south of Baltimore or even, gasp, south of Chester Avenue! I was recently at my parents’ and wanted to grab a bite to eat with my husband and sister. My parents recommended this new little place that had just opened at 46th and Woodland called “Guacamole.” 46th and Woodland?? I thought. My parents said they hadn’t been there yet but had heard good things and I figured this could turn into a little blogging adventure. I was ready to hop into the car when my sister said “why don’t we just walk?” I guess I’m turning into a South Philly suburbanite. I never would have thought to walk to 46th and Woodland, which is all of 4 blocks away from my parents. We strolled down a sun-kissed 47th street. West Philadelphia is just so perfect sometimes. 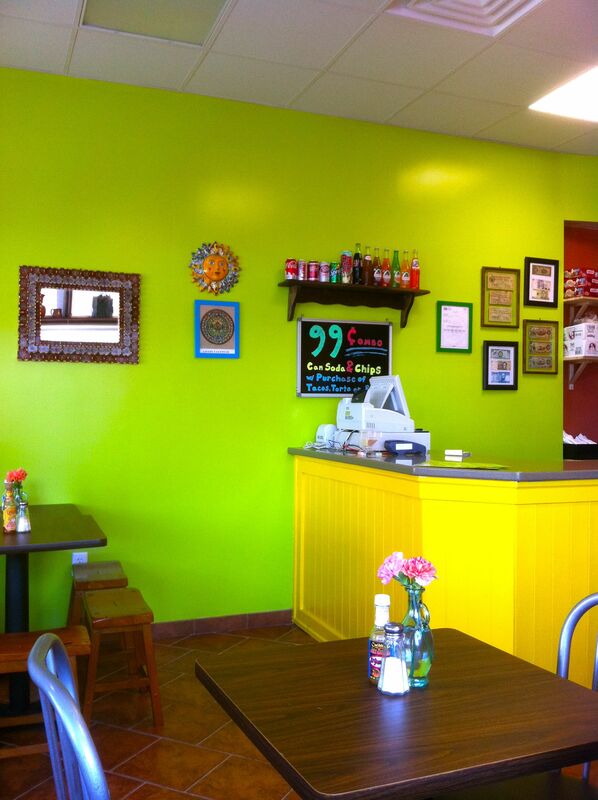 When we arrived at Guacamole, its color stood out admidst the otherwise drab homes and businesses on the block. We stepped inside the bright and cheery looking space and stepped up to the counter. 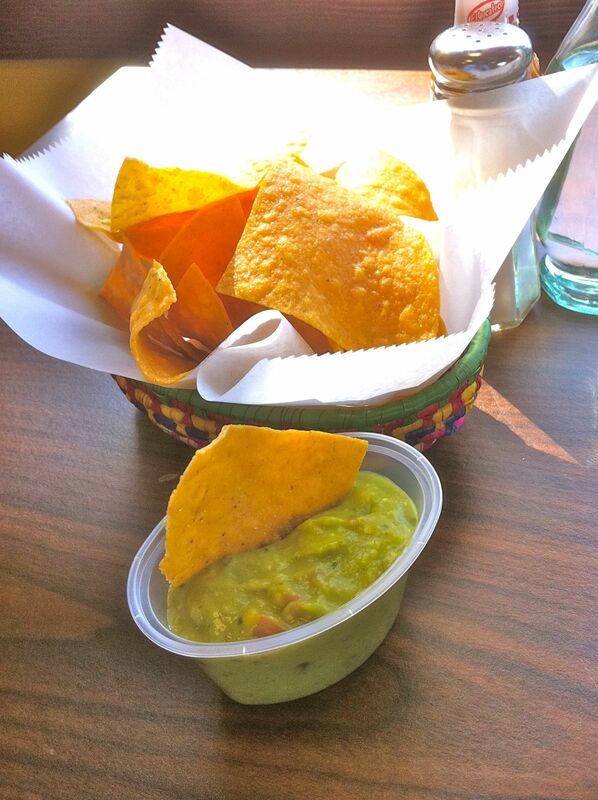 Guacamole is small, with only about 15-20 seats. You order at the counter and they bring your food to the table. My husband and I couldn’t decide which two burritos to get so we went with carne asada (beef) and al pastor (pork.) 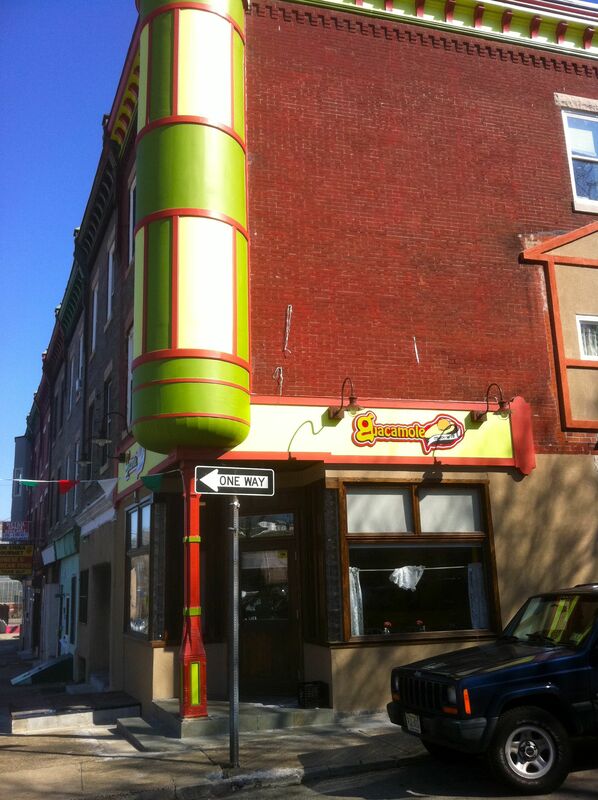 The Row Home Eats family has high standards for burritos as we order from our beloved Los Jalapenos 3-4 times a month. 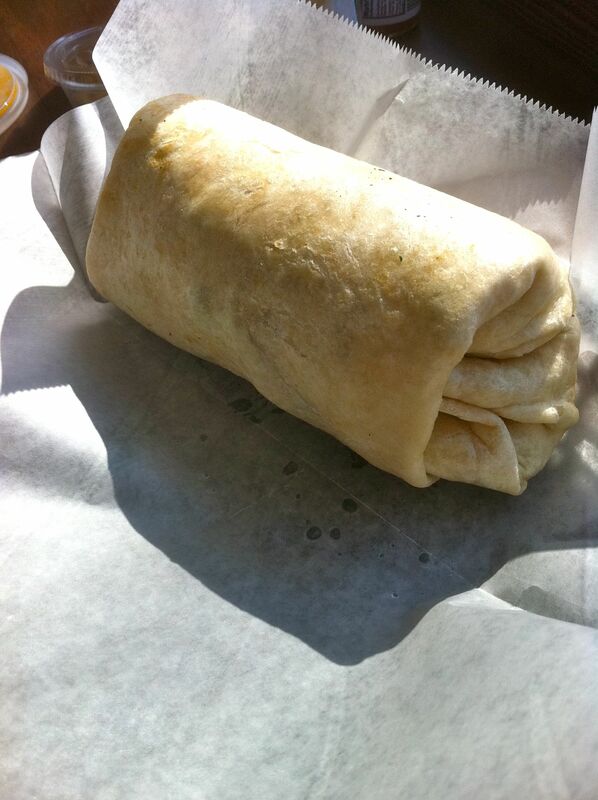 Every burrito we eat is always compared to “3 Jalas” as we call it for short. I also ordered a side of tortilla soup because, well, I wanted to try as much as possible. My sister opted for the simple chips and guacamole. The guacamole came out first and I only had a small bite. It was decent–not the best, not the worst. I prefer mine a bit chunkier with less tang to the tongue. I love how colorful the place is, from the outside facade to the paint choices and even the brightly colored baskets that the food is served in. The soup came up next and boy was it a disappointment. The thing that just makes a perfect tortilla soup is the broth and this was bland and underseasoned to the point of me not wanting to finish it, EVEN with the crispy tortilla strips as accompaniments. I had high hopes for the burritos. The burritos were decent-sized. Probably a bit smaller than “3 Jalas” or your local burrito chain. 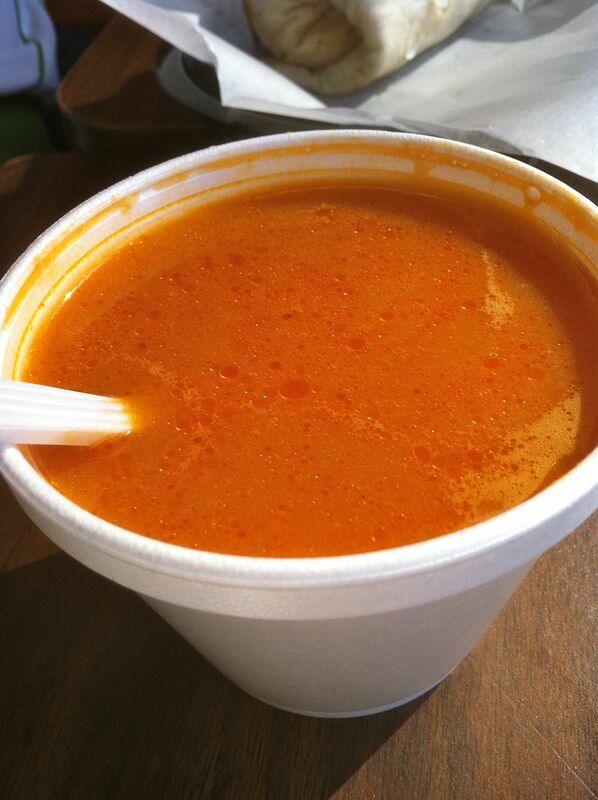 Good new is that the flavor that was missing in the soup was evident in the meat. Both the carne asada and al pastor were flavorful and sweet. My only complaint (and I think it’s legit, don’t think I was being piggy) is that I wish there was a bit more meat, less filling. My parents went to Guacamole recently and raved about their dishes. If I went back, I think the way to go would be to order one of their platters that highlights the meat a little more. I’m ok with paying $8.50 for a burrito but I want that burrito to be meat forward. You can’t fault for me that! If the owners spend some time tinkering with some of the flavors and ratios, this place could be a great quick lunch option for those of you who happen to find yourselves in the neighborhood. Oh, and if you do, make sure you swing by Four Worlds Bakery on your way home for a fresh soft pretzel. That’s what we did. and toothsome with all of the flavors complementing one another. I especially liked the rice with carrots and peas and the small salad with the tangy dressing that countered the rich mole and the beans. The owner had also just finished a catering job at the nearby University of the Sciences and offered us each a small chococate cheesecake tart on the house. When we mentioned how much we liked the bright colors of the restaurant, he told us his mother, who is an artist, had chosen them. Two of her works hang on the wall.